Comet 73P breaking up in 1995. In 1995, Comet73P/Schwassmann-Wachmann 3 did something unexpected: it fell apart. For no apparent reason, thecomet's nucleus split into at least three "mini-comets"flying single file through space. Astronomers watched with interest, but theview was blurry even through large telescopes. The comet was a hundred andfifty million miles away. We're about to get a muchcloser look. In May 2006 the fragments are going to fly past Earth closer thanany comet has come in almost eighty years. 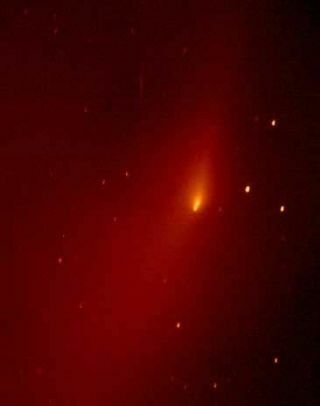 "This is a rareopportunity to watch a comet in its death throes--from very close range,"says Don Yeomans, head of NASA's Near Earth Object Program at JPL. There's no danger of acollision. "Goodness, no," says Yeomans. "The closest fragmentwill be about six million miles away--or twenty-five times farther than theMoon." That's close without actually being scary. The flyby is a big deal. "The Hubble Space Telescope will be watching," says Yeomans. "Also, the giant Arecibo radar in Puerto Rico will 'ping' the fragments todetermine their shape and spin." Even backyard astronomerswill be able to take pictures as the mini-comets file through theconstellations Cygnus and Pegasus on May12, 13and 14. Ironically, despite beingso close, these comets will not be very bright. The largest fragments areexpected to glow like 3rd or 4th magnitude stars, which are only dimly visibleto the unaided eye. "Remember," says Yeomans,"these are mini-comets." They're not like the GreatComets Hayutake and Hale-Bopp of 1996 and 1997. Those could be seen with thenaked eye from light-polluted cities. The fragments of 73P, on the other hand,are best viewed from the countryside--and don't forget your binoculars. The number of fragments isconstantly changing. When the breakupbegan in 1995 there were only three: A, B and C. Astronomers now count atleast eight: big fragments B and C plus smaller fragments G, H, J, L, M and N.
"It looks as thoughsome of the fragments are themselves forming their own sub-fragments,"says Yeomans, which means the number could multiply further as 73P approaches.No knows how long the "string of pearls" will be when it finallyarrives. This is very uncertain;indeed, forecasters consider it unlikely. But an expanding cloud of dust fromthe 1995 break-up of the comet could brush past Earth in May 2006 producing adisplay of meteors. "We believe the cloudis expanding too slowly to reach Earth only eleven years after thebreak-up," said astronomer Paul Wiegert at the University of Western Ontario. "but it all depends on what caused the comet to flyapart--and that we don't know. "The most likelyexplanation is thermal stress, with the icy nucleus cracking like an ice cubedropped into hot soup: the comet broke apart as it approached the Sun after along sojourn the frigid outer solar system," he explains. "If this istruly what happened, then the debris cloud should be expanding slowly, andthere will be no strong meteor shower." On the other hand, what if"the comet was shattered by a hit from a small interplanetaryboulder?" A violent collision could produce faster-moving debris that wouldreach Earth in 2006. "One outstandingexample is comet Biela, which was seen to split in 1846, and had completelybroken apart by 1872," he says. "At least three very intense meteorshowers (3000-15000 meteors per hour) were produced by this dying comet in1872, 1885 and 1892." Assuming a thermal breakupfor 73P, Wiegert and colleagues have calculated the most likely trajectory ofits dust cloud. Their results: dust should reach Earth in 2022, "producinga minor meteor shower--nothing spectacular. However," he adds, "theongoing splitting of the comet means new meteoroids are being sent in newdirections, so a future strong meteor shower from 73P remains a realpossibility." The watch begins on May12th.